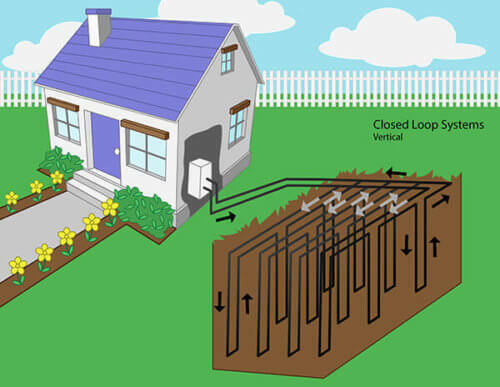 Geothermal heating and cooling, also called ground-source, is the future of the HVAC industry. Its main advantages are sustainability and much higher efficiency, when compared with air-source systems and traditional fossil fuel systems. Ground-source HVAC system options and your home – Is it a fit? No HVAC system is one-size-fits-all. An experienced GSHP contractor will perform a load calculation and take many factors into consideration when determining the size of the system needed to keep your home comfortable. Residential GSHPs are typically between 24,000 and 72,000 BTU/H, also listed as 2 to 6 tons. General sizing factors include the size of your home, it’s layout, number of windows and direction they face, amount of insulation in your walls and attic, type of roofing, landscape and the ground temperatures. It is important to note that ALL factors are relevant to properly sizing the HVAC system. Installing one larger than needed, “just to be safe,” isn’t an acceptable approach. It would waste energy by overheating and over-cooling your home. Here are the brands HVAC pros most often recommend, along with their prices. Most brands have a range of 2 to 6 tons, but some in the list offer residential units up to 6 tons. Some of these prices also include units that make domestic hot water in addition to providing HVAC. Size and type of the loop system, whether your land is relatively open or heavily treed, local soil conditions and local competition for geothermal jobs are the main factors affecting cost. Because the factors are diverse, geothermal heat pump system installation can range from about $7,000 to more than $20,000. While cost is important, it is vital that a qualified installer be hired for the work. Request free estimates from at least three contractors where you live. 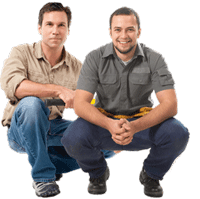 Ask each installer about the training and experience of the crew that will do the work. Call references, and look up the contractors with the Better Business Bureau, Google Reviews and Yelp. Ask about warranties. You should receive a warranty of at least five years for the labor and 20+ years for the equipment. Finally, hire a qualified installer with an experienced crew, track record of success and pricing that is fair and competitive. 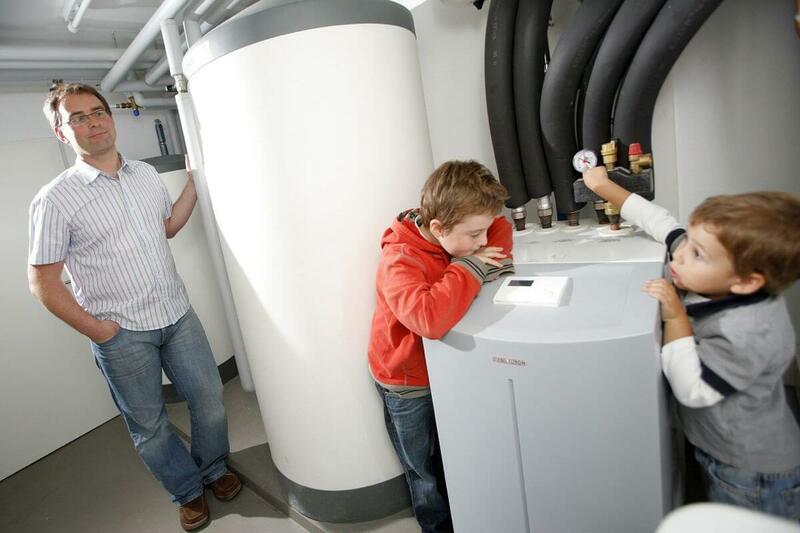 These are both heat pump systems. This means that they use a small amount of electricity to circulate fluid, which moves heat from one location to another, rather than generate it. The ground vs. air debate focuses on where the system picks up and releases heat. These gather heat from air as cold as +15F degrees (-13F degrees for High-Heat models) outside your home, and bring it inside. In the summer, they gather heat inside and release it in to the outside air that might be 90+F. Collecting heat in cold air and dumping it in to hot air simply can’t be ultra-efficient. There are two types of Air-source heat pumps in residential applications: Central Air Heat Pump and Mini Split (Ductless) heat pump. Central air-source heat-pump works very similar to your regular central air – you have a gigantic condenser outside, and two large diameter copper pipes circulating refrigerant (freon) between condenser and evaporator coil (inside unit). From there, hot or cold air is pumped throughout the house via duct system. Ductless (mini-split) heat-pump works without ducts (duh). Instead, copper lines with refrigerant run directly to each zone, were an indoor unit (evaporator head) can be individually controlled to heat or cool a single area. Ductless systems can be single or multi-zone installations. We will also be publishing many videos on Remodel Calc YouTube channel. To get notified when these videos come out, subscribe to our channel. These capture and dump heat in to earth or water, which maintains a constant year-round temperature between 50 and 65 degrees Fahrenheit. Exact temperature depends on location and the depth of the system’s piping. It is much easier to collect and dump heat at those temperatures. In short, GSHPs require much less energy to gather and release heat in moderate geothermal temperatures, compared to air-source systems, which gather heat in cold air and dump it in to hot air. Fossil fuel systems burn natural gas, propane or oil in a furnace to create heat and distribute it through the ducts. Geothermal heat pumps, unless powered by solar energy, use fossil fuel-produced electricity to circulate the water that moves heat. Moving it is cheaper than creating it. 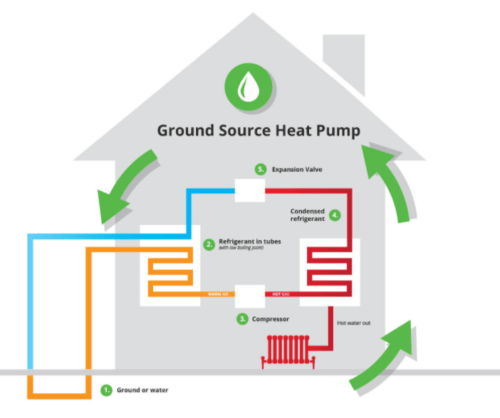 Depending on the efficiency ratings of the geothermal heat pump and gas/oil furnace, ground-source systems require burning approximately 25 to 40 percent of the fossil fuel used for traditional heating. Geothermal heat pumps circulate water, with antifreeze additives in cold climates, into the earth or a water source to collect or dump heat. Inside your home, the heat can be collected from or released into either air or water. Water to Air: These systems are equipped with an air handler that includes a blower, similar to a standard forced air system. The circulating water passes through a coil where refrigerant collects heat in the summer and dumps it in the winter. 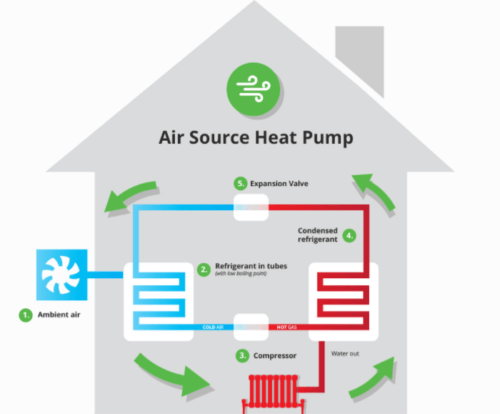 This process is similar to what an air-source heat pump does. The air handler heats or cools the air in your home by passing it over the coil, before distributing it to the ductwork. Water to Water: These are hydronic systems that use baseboard radiators and/or in ground tubing. In AC mode, circulating water in the outdoor loop passes through a heat exchanger where heat gathered from indoors by refrigerant is transferred into the water. 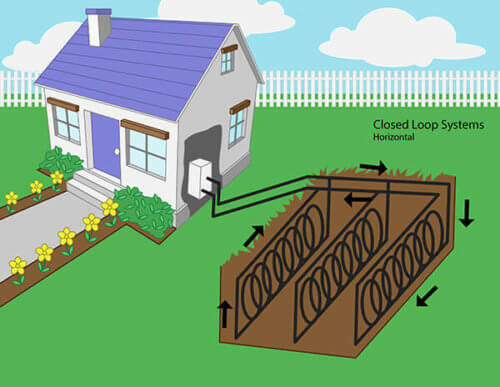 For heating the home, the opposite process is used to collect heat from the water circulating in the loop. 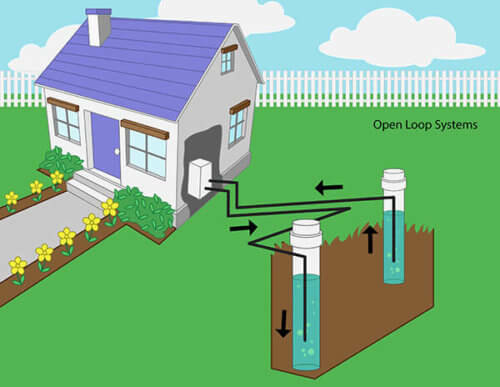 The water in the loop and the water in the indoor pipes is not exchanged. Only heat is exchanged. The bottom line is that you can use a ground-source system to replace either a traditional forced air system or a boiler system. Here are considerations, both good and bad. This system is the least costly to install. However, it requires up to 1,500 to 3,000 feet of straight or coiled pipe in one or more trenches up to 250 feet long. The good news is that there are several ways to dig those trenches, and it can be quite cost-effective. Costs will be higher where the soil is hard clay. in many cases, it is possible to dig trenches under driveways. If you have a lake or river on your property, it’s possible to get a permit to run piping into it. This step might make heating and cooling more efficient. The downside of a horizontal loop system is that it takes a large amount of land, so it isn’t feasible on small lots. Where lot sizes are small, boring holes up to 200 feet into the earth is the only way to get an adequate amount of circulation pipe into the ground, and the excavation costs are significantly higher than horizontal installation. Vertical systems often use water wells to run the pipe, since aquifers are reached in less than 200 feet in most locations. When vertical drilling hits rock, the installation might be very costly or impossible. A variation of the vertical system is the deep-angle system that drills at an angle to reduce the depth and to spread out the loops for greater efficiency. These can be horizontal or vertical and are very efficient. When heating, for example, the system consistently takes in cool water to transfer heat into rather than recycling warm water to dump the heat into. Open loop systems often require an environmental study, and that can incur a cost of $1,500 or more. The bottom line is that there is likely an option that will fit your home’s landscape, soil and geography as well as your home’s existing ductwork with slight modifications. An experienced GSHP contractor will be familiar with soil and underground aquifer conditions in your area and be able to advise you on the right type of system for your application. COP – Co-efficiency of Performance. Basically this measures how much less electric energy is used, compared to a standard resisting electric heating (electric baseboard / electric space heaters). Most Geothermal Heat Pump systems have COP of 5-6. This means you get 5-6 times more HEAT out of them, compared to Electric Baseboard OR use 5-6 times LESS energy, to produce equal amount of heat. What NONE of geothermal heat pump manufacturers include in their COP ratings (and this makes it very confusing for homeowners) is the energy used to DELIVER heat from heat exchanger to your rooms, and the energy used to circulate the Heat Exchange Fluid (although this is minuscule, compared to running duct fans). By comparison, most Air-Source heat pumps have COP of about 3-4.5 but these numbers include all energy usages (at least for ductless systems). EER – Used to measure HEATING Energy Efficiency. Compared to ductless air-source heat pumps, which can go as high as 18 EER (for one of the MOST EFFICIENT ductless systems on the planet – a Fujitsu 9RLS3HY High Heat model), a GeoStar SYCAMORE has a much more impressive 41 EER and a (5.1 COP). However, Sycamore is GeoStar’s MOST efficient unit, while average EER is about 27-32. Still impressive, when compared to highest ductless EER of 18! SEER – Used to measure COOLING Energy Efficiency. Compared to ductless air-source systems, which are by far most efficient non-geothermal Air Conditioning systems available and can go as high as 33 SEER, most GSHP do not list SEER ratings at all. Bottom line – GSHP are super energy-efficient! However, you need to account for additional installation costs from drilling or digging holes foe heat exchanger loops. You or the contractor responsible for the project will have to present a complete set of site plan drawings to the local planning or building office. A site plan/plot plan is a drawing of your property showing its current main features such as the house, deck, driveway and walkways and outbuildings. It must also show where you intend to do the necessary digging/excavation to install the loops for the geothermal system. Beyond the site plan, there are several other potential permits and requirements for installing a geothermal heat pump system. Permit costs vary widely by location, but we provide broad ranges for what you can expect. 100 year old home, high pressure a/c zoned for 2nd and 3rd floors must be replaced. Each floor about 1000 sq feet. Probably want water to air solution with vertical piping.